Eastern Kansas League rivals Blue Valley North and Blue Valley will battle for the right to play in the Class 6A championship game next week at Welch Stadium in Emporia. The Mustangs and Tigers played one of the more entertaining games of the 2017 season back in Week 3 when Blue Valley rallied with 10 points in the final 1:06 of the game to shock Blue Valley North, 34-33. Jackson Likens connected on a 27-yard field goal with 15 seconds remaining to provide the Tigers with the game-winning points. Blue Valley trailed the game 33-24 until Luke Bernard connected with Blake Brown on a touchdown pass to pull the Tigers to within 33-31. Blue Valley North led 19-3 at halftime, but consecutive touchdown passes from Bernard to Cameron Green and Brown pulled the Tigers within 19-17 after three quarters. The Mustangs would extend the lead to 26-17 on a touchdown with 9:30 remaining, but Bernard would hit Alex Totta on a touchdown pass to pull Blue Valley within 26-24. North regained a two-score lead, 33-24, on a touchdown with 3:02 remaining. After that heart-breaking loss to the Tigers, Blue Valley North fell to Bishop Miege, 33-14, a week later and stood at just 1-3 after three consecutive losses to three of the state’s top programs. 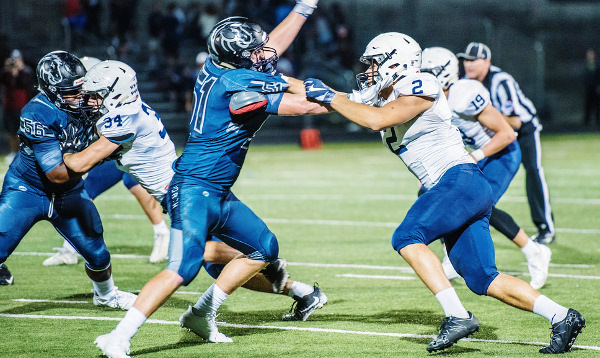 Since then, the Mustangs have won six of their past seven games with a only a 35-30 setback against 5A semifinalist Mill Valley interrupting what could be a seven-game win streak. Last week the Mustangs surprised many around the state with a dominating, 45-10 victory over then No. 2 Shawnee Mission East. Mustang quarterback Graham Mertz tossed two touchdown passes in the first quarter as the Mustangs seemed to overwhelm the Lancers in building a 21-3 lead after one quarter. Two more touchdowns in the second quarter extended the lead to 35-10 at halftime. Mertz, a 6-foot-4, 205-pound junior, is one of the state’s top signal-callers and has recently committed to Wisconsin. Mertz has been exceptional in his first varsity season after transferring to Blue Valley North from Bishop Miege. He has completed 61 percent of his passes for 2,919 yards and 38 touchdowns against only six interceptions. He threw four touchdown passes and rushed for a score in last week’s win over Shawnee Mission East. Dylan Freberg, a 6-foot-4, 215-pound tight end, leads Blue Valley North with 64 receptions for 885 yards and 10 touchdowns, while Nigel Roberts has added 56 catches for 809 yards and 10 scores. Grant Hamel is the Mustang’s offensive utility weapon having rushed for 466 yards and tallied 458 receiving yards with 13 combined touchdowns. Tony Bragulla is the Mustang’s leading rusher with 852 yards and nine scores. Defensively, the Mustang’s strength is up front where Kansas commit Miles Emery (6-5, 235) and defensive end Mason Alvarez (6-3, 190) have had solid seasons. Emery has 53 tackles, including 11 tackles for loss and six sacks, while Alvarez has totaled 48 tackles with 18 going for loss and five sacks. Sophomore linebacker Darin Robertson and junior linebacker Thatcher Robertson lead the team with 87 and 74 tackles, respectively. Blue Valley advanced to the semifinals by virtue of a big second half in beating Olathe North, 48-21. The Tigers held a slim 17-14 lead in the locker room at halftime, but exploded for 31 points after halftime. Blue Valley trailed in the second quarter until Bernard then hit Ben DeZube on an 80-yard touchdown pass to go up 17-14. Alex Totta scored early in the third quarter to expand the lead to 24-14, and after Walker Kinney’s scoring pass to Green it was 38-14 after three quarters. Bernard and Kinney have split time at quarterback all season for the Tigers. Bernard, the senior, has completed 56 percent of his passes for 1,656 yards and 20 touchdowns with six interceptions. Kinney, a junior, has passed for 1,071 yards and 12 scores against only four picks. Dezube leads a deep receiving corps with 41 catches for 831 yards and four touchdowns. Brown (572 yards) and Green (474 yards) each have hauled in 10 touchdowns passes and combined for more than 1,000 receiving yards. Junior Alex Totta is the team’s leading rusher with 638 yards and eight touchdowns, and leading tackler with 128 stops. Blue Valley North is in the state semifinals for the first time since 2003, while Blue Valley is in the semifinal round for the 11th time during that same time period. Last season, Derby defeated Wichita Northwest, 65-28, in the second round of the playoff en route to a 13-0 record and third Class 6A state championship in the last four years. Northwest finished 6-4 with an offense that averaged 50.1 points per contest, but a defense that permitted 32.9 points a game. This season, Northwest has kept the high-octane attack with 6A’s top offense at 50.9 points a contest. The Grizzlies’ defense is much improved at just 19.1 points allowed a game. Northwest has opened 10-1 against the No. 21 strength of schedule in Class 6A, according to Prep Power Index. The Grizzlies have won 10 straight after a season-opening 40-35 loss to Bishop Carroll when the Golden Eagles scored with 14 seconds left. Northwest earned the No. 2 seed on the closely competitive west side, while Derby entered as the No. 5 seed. Northwest has reached the semifinals for the second time in school history with a ’96 runner-up as the team’s best showing. The Panthers have not been as dominant as last season’s team that had a total margin of 625-159. Derby has played a harder SOS (No. 2 in 6A) with a total margin of 509-265. Additionally, Brandon Clark has done a fine coaching job with Derby losing six defensive starters to injury. Junior Hunter Igo and sophomore Grant Adler shared snaps at quarterback the first two games, then Adler took over and suffered injury. Igo has been back under center full time since Week 6. Northwest coach Steve Martin is fond of saying that a team has to stop the run to win games in November. That’s ultimately going to decide Friday’s contest between the prolific offenses and great running attacks. Derby fell to Goddard, 50-20, in Week 2 to end its 24-game winning streak. Since then, the Panthers have won three close high-profile games against Carroll (54-45) and the last two weeks in road wins versus Manhattan (21-14) and No. 1-seeded Free State (55-49). Derby has had a knack for coming up with huge plays in key times. Carroll ran 74 plays for 523 yards, while Derby had 55 plays for 432 yards. The Panthers finished with zero turnovers, six fewer than Carroll. Versus Manhattan, Derby held a 357-283 yardage edge but the Indians had a slight play advantage (58-56). Free State won the yardage battle, 581-538. Against Manhattan, Derby had a key interception. Versus Free State, the Panthers came up with a fumble recovery inside Panther territory late in the fourth quarter and the game tied at 49. In overtime, Igo defended a Free State fourth down pass that kept the Firebirds from scoring. Brody Kooser won the game on the next play. Kooser rushed 29 times for 197 yards and two scores, while Igo had 28 carries for 167 yards and four scores. He completed 8 of 14 passes for 150 yards and a score. A key moment in the game came when standout Free State running back Jax Dineen was injured in the first quarter and missed the rest of the contest after he opened with three carries for 70 yards. Gage Foster had 28 carries for 178 yards for Free State. Against Manhattan, Igo delivered 15 carries for 117 yards and passed for 141. Kooser finished with 25 carries for 95 yards. Northwest has faced little resistance since the Carroll loss, a game when the Grizzlies had trouble in key spots, including pass interference, a critical fumble and third-down plays. Two weeks ago, Northwest defeated Campus, 57-24. In the regular season, Derby beat Campus, 48-20, but had to come back from a 17-7 deficit. Last week, Northwest easily handled a gassed Garden City squad, 49-6. Northwest had a 653-163 yardage edge, including 17 carries for 222 yards from junior Breece Hall. Overall, Hall has 175 carries for 1,907 yards and 28 scores. Junior Ryan Johnson has 91 carries for 938 yards and nine TDs. Senior Austin Anderson has 101 of 181 passing for 1,814 yards with a 25/7 TD/INT ratio. The Grizzlies have 15 offensive turnovers and stand at plus-8 in turnover margin. Overall, Northwest, always known for its fast pace, has averaged 54.3 plays per game, less than the previous couple of years. However, on a per-play basis, Northwest is just as proficient. This year, the Grizzlies have nine yards a play, 322 rushing yards a game and 488 total yards a contest. Last season, Northwest had 61 plays a contest, a state record 547 yards per game and 325 rushing yards a game with also nine yards a play. In ’15, a 10-1 season, the Grizzlies had 72.4 plays a contest, 539 yards a game, 325 rushing yards a contest with 7.4 yards a play. The top-three tacklers are all juniors, led by 136 stops from Josh Carter. Junior Marcus Hicks, a high-profile Division I prospect, has 18.5 TFLs, just off the team high of 19 from senior Garrett Bridwell. Since ’04, Northwest is 0-5 against Derby, though three of the five meetings are within 10 points. This is a close matchup and a virtual pick’em. Northwest does have the statistical edge and gets the Panthers at home. However, Derby has overcome home field advantage and personnel deficiencies in multiple games, including Free State. The Panthers had multiple players questionable in mid-week and are on the road for the third straight contest.